Rural Revolution: Can you dig it? Remember the 70's? When people think of bizarre fashions, they tend to think of the 60's, but the stuff that came out of the hippie decade morphed into weird stuff that people actually took seriously. It was perfectly acceptable to wear this junk to even the office or church. Gack. Glad I was a kid during this time and blissfully unaware of adult fashion trends. For a trip (and fall) down memory lane, check out this link. I think the absolute worst were the photograph shirts. Shiny polyester with a montage of photographs all over them, unbuttoned to the navel, long pointy collars, and a dozen gold chains. Or maybe the platform shoes with transparent, hollow chunky heels filled with water and goldfish. Is it any wonder we are going to heck in a hand basket? I mean, all our pride has been stripped away by bad fashion! Gack is right!!! Ahhhh, but don't forget that the 70's also spawned The Dry Look!!! Truly it is a much nicer look on men. No more Brylcreem for that nasty slicked-back look. The Men-In-Belted Sweaters nearly made me gag and laugh at the same time. What fun to look back! Double Gack...to this day the smell of patchouli oil, send me into a 70's remembrance nightmare! LOL. I was as teenager in the 70's. I had a pair of plaid bell bottoms, some platform shoes, a rust colored leisure suit. Those print polyester disco shirts were all the rage. Truly a crazy decade. But then every generation has something to be embarrassed about. 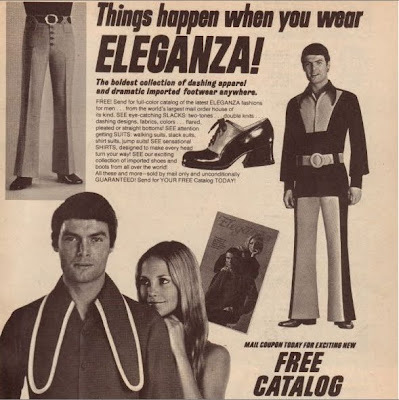 Leisure Suits...now there was a men's fashion statement that said "Hey, look at my bad taste in clothes." Thanks for the memories (I think). i grew up in the 50s,60s and grad. hs in '71. i collect vintage clothing patterns from the 30's 40's,50's and the only decent dress from the 60's was the a-line...it is classic! the prints and fabric for clothing during the 60's and 70's was pretty awful..especially those double-knit dresses that could literally stand up by themselves! sadly, in the 70's we saw an end to the 3yards for a dollar..now most fabric is made in china for 6 dollars and upward per yard. I was a young adult in the 70's. (Graduated from high school in '71.) I'm here to testify that only the "players" (pronounced playa) dressed this way. Party people, night club people, guys cruising for drugs and one-night-stand women. I was young and fancy free, yet frequently laughed my head off at someone dressed like this, especially if it included a large "Fro" hairdo. Most of us dressed a bit like Travolta in Saturday Night Fever. And though it looks dumb now, what we consider fashionable today will look just as dumb 40 yrs from now. I can't wait to hear the fashion comments twenty years from now about the baggy britches worn by the younger male population these days! Some wear the waist bands on their jeans six or eight inches below the waistband on their boxers ..and they dress that way on purpose! If there was a fire in a crowded theater, they would be the first ones trampled in the panic ...no WAY could anyone run with the crotch of their pants down by their knees. Ugh! if this link works for you, that's me on the right, in the zip-front bodysuit and wide-wale flare-leg cords (purple!) with matching belt and ginormous buckle. not sure why i wasn't wearing my wallabies instead of those suede oxfords...no comment on the blouses that passed for little girls' dresses in those days. Ah, perhaps these fashions were foisted on us to take our minds off of Jimmy Carter, Misery Indices, oil embargos and the like. Holy polyester Batman! 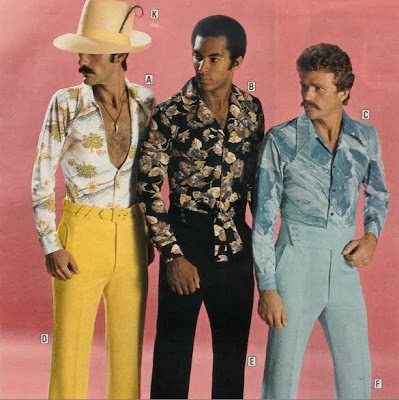 I hope these fashion nightmares of the 70s stay buried! My mom has a picture of me in green plaid bell bottoms (polyester, of course) wearing a yellow King Tut tee shirt. His treasures were on display in New Orleans that year and we took a family vacation to see it.